A good fairy tale needs some scary and unexpected twists. After a run of clean sheets and narrow victories, Leicester’s unlikely march to the title had threatened to become predictable. That changed on Sunday. Leicester drew 2-2 at home against West Ham and ended the match without talisman Jamie Vardy, who was sent off. Normally, two points dropped and a one-game suspension for the key striker would be a disaster in a tense title race. Yet, at the final whistle, Leicester celebrated as if it had won. Leicester survived a second-minute scare when Cheikhou Kouyaté’s header hit the inside of one post, flew across the goal and hit the other post before Kasper Schmeichel gathered it. Leicester’s goal seemed to be protected by a fairy-tale spell, except that Schmeichel had brilliantly clawed the header onto the post and the West Ham players had then either started celebrating or simply stood and watched as the ball bounced across the goal. Leicester made its luck, West Ham didn't. When Vardy rifled Leicester ahead following a surgical counter-attack after 18 minutes, it seemed to be business as usual. But the match was about to be taken over by referee Jonathan Moss. Officials are often accused of placing themselves in the spotlight. Moss had little choice. Like Tottenham, Leicester are a sneaky dirty team adept at dodging serious punishment for its crimes. Within seconds of the kick off, Danny Simpson plowed into the back of Dimitri Payet, West Ham’s chief creator, and got away with it. Vardy scored after a break that followed a West Ham corner at which Robert Huth had assaulted Winston Reid. Huth got away with that. With tempers rising, Moss probably sensed he needed to impose some control. In the 28th minute he showed Vardy a yellow card for a spiky tackle on Kouyaté. It was a soft card but it sent a message. The message was ignored. After 56 minutes, Vardy, trying to win a penalty, performed a theatrical, pirouetting pratfall. Buster Keaton would have been embarrassed. Moss had no choice but to show a second yellow. Huth and Wes Morgan seemed to have been freaked out by the second-half appearance of Andy Carroll, though a big, slow, physical striker should suit them perfectly. West Ham was struggling to create chances, yet, at every corner, Leicester’s central defenders performed vigorous Hulk Hogan impersonations. Moss spoke to them. Twice. Even so, after 84 minutes, Morgan hurled Reid to the ground. Carroll buried the penalty. Two minutes later, Leicester finally cracked from open play and Aaron Cresswell, the West Ham left back, smashed the ball home. The plot seemed familiar. On Valentine’s Day, Leicester led 1-0 at the Emirates after a first half Vardy penalty when Simpson was sent off in the 54th minute. Arsenal then came back to win, 2-1, scoring the winner in the 94th minute. The twist was that Sunday’s game had not yet reached the 94th minute. West Ham retreated. Leicester pressed. In the fourth minute of added time, Jeffrey Schlupp skipped harmlessly along the side of the penalty area. Carroll, doing damage in his own box for once, bundled into the Leicester player who went flying. Moss pointed to the spot. It was harsh, but West Ham (and Tottenham fans) should direct their ire at Carroll for making an unnecessary and clumsy challenge. Leicester had shown it can overcome adversity, even if that adversity is of its own making. Shot-shy Gunners — If Arsenal’s players really believed that Leicester’s draw had given them a chance of stealing the title, it did not show for much of the match at the Emirates on Sunday. The Gunners threw away two points as they drew, 1-1, with Crystal Palace. Palace had come to park their bus. Arsenal enjoyed 72 per cent of possession. They used much of it very prettily but with little urgency or thrust. The Gunners did take the lead just before half time in unlikely fashion. Alexis Sanchez, who is 5-foot-5, scored with a header against the hulking Palace defense. Much of the second half was a gentle siege. Arsenal managed 21 shots but only six were on target and most of those were harmless. “We had a lot of possession but we could not transform that into clear cut goal chances,” Arsène Wenger, the Arsenal manager told Sky TV. Inevitably Palace punished Arsenal. Yannick Bolasie, showing an aggressive purpose Arsenal lacked, caught Petr Cech out with a rasping drive just inside the near post in the 81st minute. If Wilfried Zaha had kept his head a few minutes later, Palace would have won. The match was a microcosm of the Arsenal season. The Gunners dominated but disappointed. Arsenal failed to exploit Leicester’s slip. It failed to apply pressure to Tottenham. Even Wenger could find no positive spin and no excuses. “Bad result for us,” he said. Arsenal fell to fourth behind suddenly surging Manchester City. The gap Arsenal needs to focus on is not the 13 points that separates it from Leicester, but the four points between it and Manchester United in fifth. Under pressure — Perhaps 3-0 scorelines flattered both Newcastle and Sunderland on Saturday. Before sealing victory with two late goals, Newcastle had several very scary moments in the second half against visiting Swansea, a team with little to play for. Sunderland enjoyed the benefit of every important marginal refereeing decision against fellow-strugglers Norwich at Carrow Road. Nevertheless, both Sunderland and Newcastle looked like teams who knew what they had to do to win. They came with a plan and saw it through. Norwich looked timid and clueless. Even though the Canaries remain perched in 17th place, its margin of safety all but disappeared. It is a point ahead of Sunderland and three ahead of Newcastle and has played a game more than either. Yet, the fact that Norwich was awful this weekend while Sunderland and Newcastle were quite good tells us almost nothing about the rest of the season. Newcastle has played well several times this season only to revert to rubbish mode the following week. Sunderland’s problem has been slightly different. It has consistently played quite well and lost. On Saturday, Norwich seemed to be crippled by the pressure. But the inconsistency of all three clubs makes it hard to predict which will cope best over the remaining games. Are you watching Tottenham? — When their team take the lead, Leicester fans have taken to taunting their closest pursuer. They did it on Sunday, before things took a turn for the worse. Tottenham plays at Stoke on Monday. Unless Mauricio Pochettino had organized one of his infamous double training sessions, Tottenham probably were watching on Sunday. They probably watched Arsenal as well. The question is which draw was really the most helpful important for Spurs. After Sunday’s games they are eight points behind Leicester with a game in hand and five points ahead of Arsenal, which has played the same number of games. The weather forecast is favorable. Monday is unlikely to be a rainy night in Stoke. A victory will apply a little more pressure to the Foxes and keep alive Tottenham’s slim hopes of a title. More importantly, it will create an eight-point cushion over Arsenal. Spurs fans may be dreaming of the title, but their recurrent nightmare is being caught by Arsenal. In recent seasons, Arsenal’s hot breath on Tottenham necks has been enough to provoke late season attacks of indigestion. Arsenal overtook Spurs late in the season in 2013, 2012 and, infamously, on the last day in 2008. Rival fans coined a word for it. Monday night might show if Pochettino has succeeded in making Spurs less Spursy. 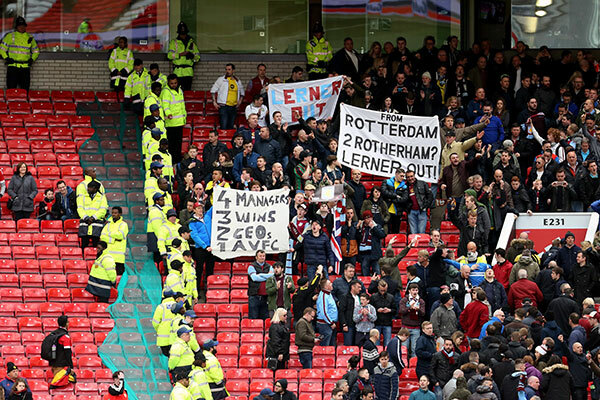 Booing Americans — Aston Villa’s ugly season came to its inevitable conclusion at Old Trafford on Saturday where a 1-0 defeat confirmed relegation with four matches still to play, ending a run of 28 seasons in the top flight. Villa is the biggest club from Britain’s second biggest city and a former European champion. Its fans expect better. This season could not have been worse. The supporters have entertained themselves by finding inventive ways to focus their fury at the owner. They have created an #RandyLernerOut Twitter hashtag. They have composed, and chanted a “Randy Lerner Out” song. We have been here before: English fans hating American owners. Most Manchester United fans would still like to be rid of the Glazer family. Liverpool fans were delighted when Tom Hicks and George Gillett were forced to surrender the club. For now, Arsenal fans are venting their fury at Arsène Wenger, but if he goes then Stan Kroenke, the largest shareholder, becomes the next target. There are sound reasons for English soccer fans to be suspicious of American owners. But English soccer has also been unlucky, for the most part, with the American owners it has had. Sports teams are unusual businesses because there are two ways to measure success. The first is profit and loss; the second is wins and losses. Research by economists in the 1950s and 1960s found that while franchise owners in the American major leagues were driven primarily by profits, British soccer club owners were in it for the glory. Over the last two decades, North American leagues, have introduced, or strengthened, salary caps and luxury taxes to guarantee profits and rein in any owners who might be tempted to try to buy success. Meanwhile, English soccer has welcomed rich owners prepared to do just that: Jack Walker at Blackburn, Roman Abramovich at Chelsea, Sheikh Mansour at Manchester City and even Vichai Srivaddhanaprabha at Leicester and Peter Coates at Stoke. The rich owners, and their lawyers, have so far thwarted attempted "Financial fair Play" rules. Most of the Americans who have bought English soccer clubs already owned franchises back home. They have a general problem in applying their American experience to soccer because the expectations are different. But they struggled for another reason. Most of them have not been particularly successful owners even under American rules. Between them the Glazers (Tampa Bay Buccaneers), Hicks (Dallas Stars and Texas Rangers), Gillett (Montreal Canadiens), Lerner (Cleveland Browns), and Kroenke (Los Angeles Rams and the Colorado Rapids and, under the name of his wife, the Colorado Avalanche and Denver Nuggets), have managed one Super Bowl, one Stanley Cup and one MLS Cup in a little over 91 combined seasons of ownership. That’s not a good percentage. In this mediocre company, Lerner stands out. He inherited the playoff bound Cleveland Browns midway through the 2002 season and sold them in 2012 without ever having reached the post-season again. The solitary exception is the Fenway Sports Group, which showed it can deliver fairly consistent success by guiding the Boston Red Sox to three World Series victories in 13 seasons. Where the Glazers and Hicks and Gillett leveraged their takeovers and bled their clubs to pay the debt, FSG has reinvested. Over the last five years Liverpool has outspent every Premier League club not based in Manchester or owned by Abramovich and invested in ground improvement. Yet the furious protests earlier this season over planned ticket price rises showed the suspicion with which English fans view the way American owners handle money. For even successful American sports owners, English soccer presents unfamiliar and thorny problems. Unfortunately for Villa, Lerner’s record suggests he is not a particularly astute owner. He has reportedly been trying to sell the club for almost two years and has been trying to balance the books to make Villa more attractive. Relegation could the club as much as £100 million ($142 million). Lerner and his soccer club must pay a price, both in money and lost glory, which the franchise system guarantees American owners, however greedy or inept, never face: relegation.